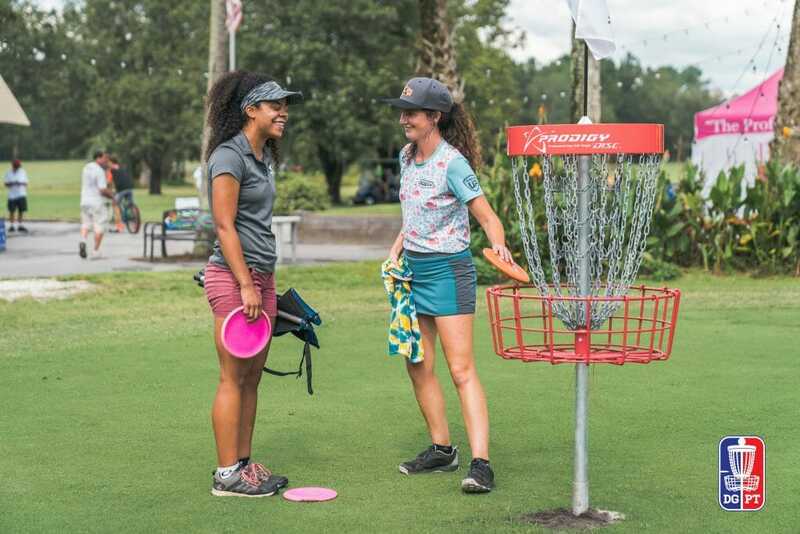 The Disc Golf Pro Tour Championship has begun at New World Disc Golf in Jacksonville, Florida, and day one gave us eight Open Women players fighting for the chance to continue their seasons by qualifying for the semifinals with a top four score. Paige Bjerkaas ended with the hot round of the day, shooting a 2-over par 68. Bjerkaas led all players with finding Circle 2 in regulation at a 50-percent rate. She also executed 90-percent Circle 1 putting. Bjerkass will not take the top qualifying spot in the next round, however, due to the “Drew Gibson” rule. Tour points determine seeding in the semifinals, meaning Bjerkaas takes the number two spot. Madison Walker had the second best round on the day, carding a 3-over 69. She got there with 94-percent Circle 1 putting and 33-percent from Circle 2. 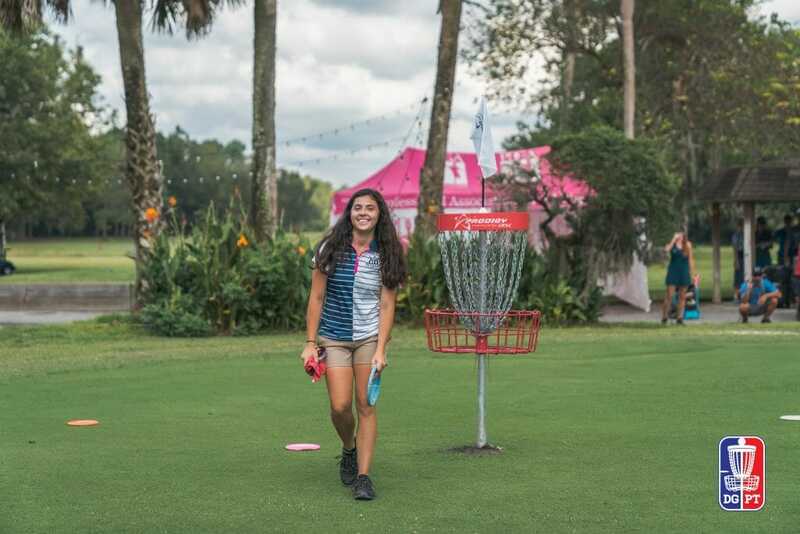 Walker was mostly cruising through the round until she took a triple bogey on hole 18 where she went out of bounds three times. The late drop did not affect her seeding for the semifinals, nor did it threaten her overall advancement position. Walker tied with Ellen Widboom and Lisa Fajkus with the most birdies on the day. Rebecca Cox, who is still not at 100-percent after a shoulder injury, tied with Widboom, carding a 6-over par 72 to advance to the next round. Seeing Fajkus miss the cut may be the biggest surprise from the FPO side. She carded several out of character two-putts and doesn’t have quite the distance some other players in the division have though. Kona Pani, who finished tied for sixth, noted that many of the tee pads on the course were slick, and that bathrooms had not yet been placed on the course for the opening cards, making for an uncomfortable round. Cox and Widboom will be carded with Paige Pierce and Jessica Weese for the semifinal. 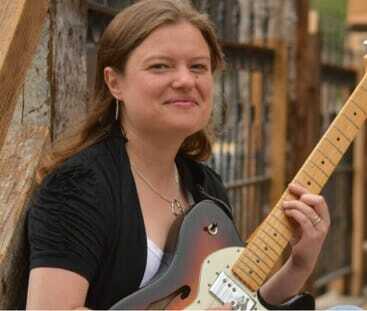 Bjerkaas and Walker will find themselves competing against Sarah Hokom and Catrina Allen. The winner of both cards plus the two remaining women with the best scores will advance to the finals. 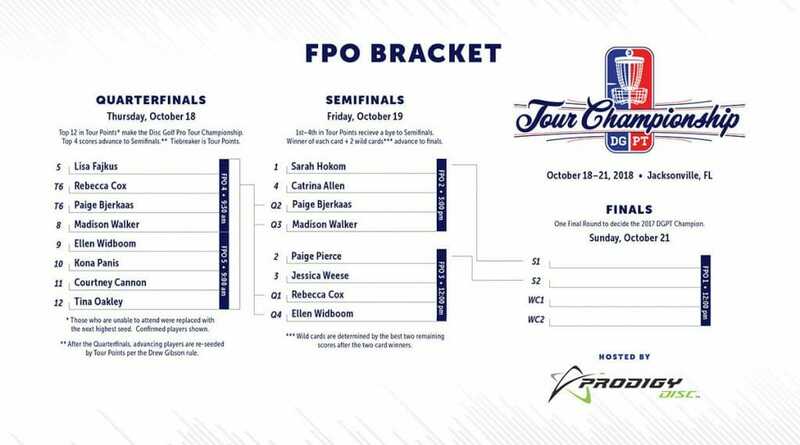 Both FPO semifinal cards will be streamed starting at 12 pm eastern time on the DGPT YouTube channel. The Open Women have Saturday off before the final on Sunday. Comments on "Bjerkaas Leads Four Through To DGPT Championship Semis"